Of Labels & Decorative Tapes For Your Garments? Here is the company that can do it for you. We serve our customers to the fullest. The labels are in ready to stitch form. The labels have soft edges and smooth feel. The wearer will not be forced to cut the labels off the garment due to itching. The label colour will not wash out. You can order the brand label, size label & care labels. Just follow the 4 simple steps given below and you will have decorated your garment with your own brand name and/or suitable decorative tapes. Order our Label Kit by paying Rs. 500. The kit contains 27 different types of textile cloth printed labels, several woven labels and 27 decorative tapes. These products are manufactured by us with our experience of 25 years for various renowned garment manufacturers within and outside India. On receiving the label kit, select the labels of your choice from the kit and send us your artworks. Ask for a quotation for your chosen items. Make the required payment as per Bank details. Send us an E-Mail at bhadalkar@arrowtextiles.com informing us of your order. Please do not forget to attach the Format for Customer. Orders are despatched in about 15 days. The label kit is a brochure containing 27 representative samples of fabric printed labels in various widths & lengths, several woven labels and 27 decorative tapes. You can see the beauty of each product as well as get a hand-feel. Each product has a specific number. Choose the label that you like & use the width & length of the label to fit your artwork. Ask for a quotation for your chosen items. Order the label kit today. The Label Kit costs Rs. 500 all inclusive. 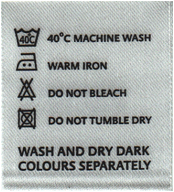 Wash Care label shows how to wash the garment so that it's life is enhanced. 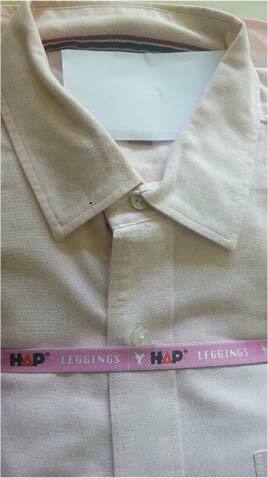 The style label indicates the fitting style of the garment. The main label represents brandname of your garment. The various tapes are used for decorating the garment. Such bands improve your brand image. The band is duly stuck and finished. The bands are available in 12 mm width. There are 2 types of fabrics – Satin and Tafetta. Decide the fabric – Satin or Tafetta. Simply slip it on the garment. Minimum order qty – 3000 Pcs. 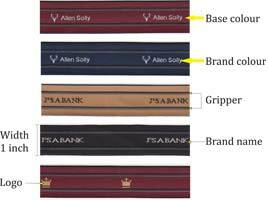 Price:- Satin 12 mm bellyband will cost you Rs. 4.50 per pc. Landed at your doorstep. Tafetta 12 mm bellyband will cost you Rs. 3.00 per pc. Landed at your doorstep. Unique solution to hold the tucked in shirt as it is. To be stitched inside the trouser or shorts all along the waist. Width is 1 Inch. Your brand name and logo will appear on the tape as shown. You can choose your own color combination for the base, brand and logo. We can supply as low as 500 metres. The price is just Rs. 30/- per meter. Such labels improve your brand image. Simply insert the button in the hole of the label. Want To Order The Label Kit Brochure Now? Deposit Cheque in Your Nearest AXIS BANK Branch or By Money Transfer. How many washes will the print color withstand? We cannot guarantee the number of washes, but the print will last tens of washes. Are the labels ready to stitch on the garment? Yes. We offer single labels duly cut & folded. Can I select the base color of my choice? Can I change the base material of the Fabric printed label? No. Please select from the label kit. Can I select the lettering color of my choice? Yes. Your artwork is welcome. Will the labels shrink after washing? Will the labels withstand enzyme wash? Only Woven labels can withstand enzyme wash.
Will the label color bleed on the garment? Do the labels contain hazardous chemicals? 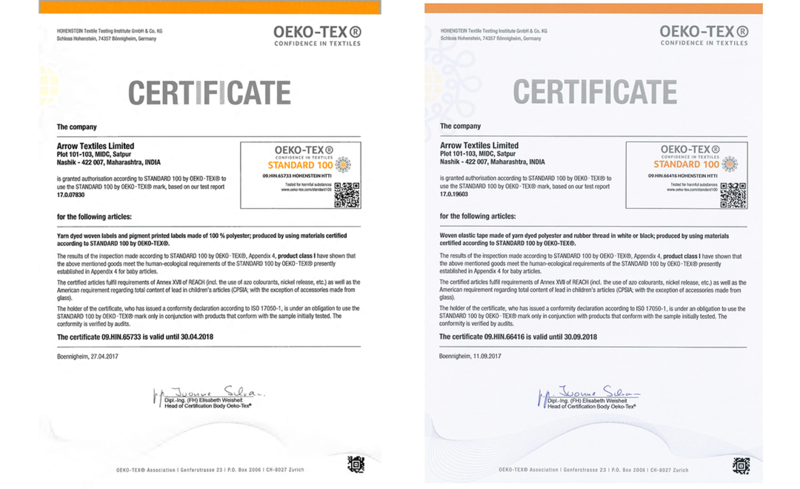 Is your company ISO-9001:2015 certified? Can I change the dimensions of the fabric printed label? No. Select the dimension from the label kit. Follow steps 3 & 4 on the how to order page. Mention the special number of your product from the earlier invoice. In which format should I send the artwork? Do you make the same label in iron-on form? In how many days will the labels be dispatched? By which courier will you send the goods? Blue Dart or First Flight. What will be minimum order quantity? 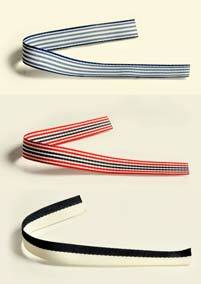 The minimum order quantity for fabric printed labels is 3000 and for woven labels is 5000. How many colors you can print on a label? We can print a maximum of 6 colours, but the beauty of a label may come from 2-3 colours also. Will you supply labels to my place which is out of courier service area? We will give you a login ID & password when you order a label Kit. Go to www.arrowtextiles.com & go to the link Customer support. Enter your login Id & password & you will be able to track your order. How do I communicate any complaint? What is your refund/replacement policy in case we don't like the labels? We cannot give any replacements. We can only improve your next supply. Will the indicated prices change if my label break-ups are more? The prices are same for up to 3 break ups. But for more break-ups the price will increase. Please ask us for revised prices. For example, if your break-ups are for S, M, L, XL, XXL etc. your break-ups are for more than 3.